The oldest artisan distillery in Alsace, which today holds the EPV label – Entreprise du Patrimoine Vivant – for its outstanding know-how. Founded in 1850 by Joseph Lehmann, our know-how has been passed down from father to son for 5 generations. It was first my grandfather, then my father who instilled in me their passion for distilling. They taught me to distil spirits with an authentic taste, to refine the fruit in such a way as to reveal every facet of its delicacy and complexity. This know-how cannot be improvised. It is subtle and careful work that is acquired with time. The art of distilling requires expertise, precision, patience and unbounded enthusiasm for each creation. This family heritage allows me to approach each day as a new challenge to perpetuate this ancestral tradition in a spirit of innovation and creativity. The distillery is today the oldest artisan distillery in Alsace, distinguished by the prestigious label EPV – Entreprise du Patrimoine Vivant (Living Heritage Enterprise). This state label is a guarantee of the excellence of our rare and ancestral know-how « made in France ». Our eaux-de-vie eloquently express the long tradition of quality and refinement in French gastronomy, for which they are ambassadors all around the world. It is during the summer period from June to October that we buy the fruits, most of which come from small local producers. To make our eaux-de-vie we choose the best fruits, those which are fully ripe and healthy. After going through the hands of the Master Distiller, the fruits are then allocated to different vats for the fermentation process. Several weeks of patience and vigilance and then distillation can begin. Distillation is done in a traditional way in two successive heatings in copper stills of the Charente type. Only the “Bon Goût” or “Coeur de Chauffe” is kept to age. For several years (at least 3) the eaux-de-vie, still at a high degree of alcohol, develop and improve in vats, demijohns or wooden barrels depending on the type of product desired. The quality of the aroma, the flavour, the delicacy of the eaux-de-vie depend on the fruit. They must be of top quality and therefore be very carefully chosen. When the Master Distiller has chosen the fruits he has the choice of two production processes: distillation after the fermentation of the fruits and distillation after maceration of the berries. The fruits are placed in barrels or vats. They quickly form a thick sweet mass; fermentation begins after 24 or 48 hours due to the action of the natural yeasts in the fruits. This fermentation continues for about ten days, then slows down and finally stops after six weeks. All the sugar has by then been transformed into alcohol which will diffuse the aroma of the fruit; the quality of the finished product will largely depend on the fermentation process. The distiller must therefore carefully monitor this essential stage: the barrels and vats are then sealed until distillation which will allow the extraction of the eau-de-vie. Raspberries and wild berries do not have the necessary sugar content for fermentation and would not produce sufficient alcohol. Therefore they must macerate in a wine eau-de-vie. After a period of at least one month, distillation can then begin. The shiny copper still now comes into its own! It’s the still that carries out the miraculous transformation but always under the watchful eye of the distiller, who supervises and conducts this operation. It’s also at this moment that comes into play the know-how of the Master Distiller; his skill and experience are indispensable to select and keep the most noble parts – the “heart of the repasse”. The distillation is carried out in two successive heatings in our Charente-style stills. The first heating extracts « la petite eau » – a light alcohol about 25° vol; the second collects the « heart of the repasse », putting aside the imperfect products of the distillation process, the “heads” with a too bitter taste and the “tails” too rich in superior alcohols (Heads and tails refer to the alcohol produced at the beginning and the end of the distillation). It’s then that the Master Distiller, the professional, passionately fond of his products, recognizes the moment which between “heads and tails” will produce the “heart of the repasse”- the essential part containing the most subtle aromas which give to eaux-de-vie their inimitable quality, smoothness and lingering taste. The exact length of the ageing process is part of the know-how and the secret of the distiller. It can be as long as several years. “Fruit eaux-de-vie, we put them in the attic”, goes the old saying. It’s a very ancient practice which consists of placing the eau-de-vie under the tiles of the attic in simple demijohns closed by a cloth. The big differences in temperature favour the evaporation of the esters and the neutrality of the glass container makes it possible to preserve all the purity of the aroma and to keep the eau-de-vie white, clear and fiery. Fruit eaux-de-vie can also ripen in vats, according to the type of fruits and their origin. Powerful and hard on leaving the still, the eau-de-vie becomes more subtle and more round as it ages. This label “Entreprise du Patrimoine Vivant” – is a guarantee of excellence, of rare and ancestral know-how. It is a mark of recognition bestowed by the Minister of the Economy, Finance and Industry. 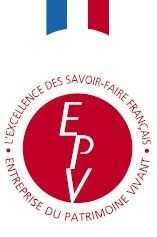 These companies labelled EPV represent the spirit and the know-how “made in France”. Possessing a specific heritage, these companies are characterized by rare skills based on the mastery of traditional techniques. The EPV companies share the same values, the same passion for their craft and together form a real address book of an irreproachable quality. The process of awarding the EPV label is carried out by experts. The appreciation and interpretation of these award criteria are entrusted to an independent National Commission made up of professionals. Drinking our bandies is a real ceremony ! There are endless ways to enjoy our exceptional brandies. For some, coolness is a must. They cool their glass with ice until condensation forms on the sides. Once the glass is “chilled” they gently pour in the brandy and sip it delicately. We then have the surprise of discovering the elegance and intense aroma of the fruit. In this way, a cold temperature brings out the characteristics of each fruit and the flavour becomes more mellow. Others prefer to enjoy their brandy in a hand-warmed glass or in a coffee cup which is still warm – an equally acceptable way of appreciating the qualities and the aromas of the great fruit brandies. Williams Pear, Mirabelle, Cherry, Raspberry, Quetsch, Plum… feature among the most noble French eaux-de-vie. They are the quintessence of the fruit whose aroma and flavour they keep preciously. Natural products “par excellence”, French eaux-de-vie are produced according to ancestral recipes and skills which are the well-kept secret of the distiller. Our fruit brandies eloquently express the long tradition of quality and refinement in French dining, for which they are ambassadors around the world.